Well said. Here’s my two cents. 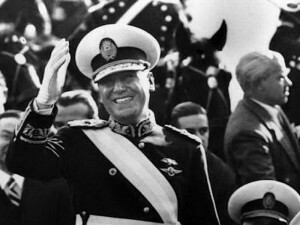 Peron was able to do what he did because the Argentine population–and in particular the intellectual elite–grew intellectually lazy and got fascinated by the crazies coming (what’s new?) from Europe. Society was fascist years before Peron. HE could have done nothing without the massive support of the people who TO THIS DAY still votes for anything with the Peron label on it. By October 17 2015 Argentina would have endured 70 years of Peronism of one type or another. Yet, the only thing Peron deliver were those seven years of prosperity–the time the money in the bank lasted–The country foolishly believes that somehow those times will come back. I may be wrong but I think the American people are about half as foolish as the average Argentine. When the thinking half gets back on the driving seat they will have to figure out for all of us how to erase the disease of Liberalism.Don’t look to Argentina too much, look to Detroit and ask yourselves if you really want that future for yourselves. Detroit had the highest standard of living IN THE WORLD in 1945. That’s when the Liberals started running the show there. Study Detroit and may be you will see a way to cure the disease. Argentina may come back one day when its population resumes using their brains. So far no signs. It’s up to you Americans to save the world one more time.